I’ve spent the past few days in Los Angeles, watching set-up and rehearsals for this Sunday’s Grammy Awards. Macs are a critical element in producing the live ceremony, and I got a chance to see just how critical as the production crew prepared for this weekend’s big show. You can read that report here. I also got the chance to find out the answer to a question that I had always wondered about while watching the broadcast at home—exactly who knows the name of the winner before the envelope is ripped? The answer: essentially, nobody involved with the production of the show. And that includes the member of the production responsible for playing the music of the winning artist the moment a particular award is announced. That roles falls to Eric Johnston, who told me that he’s watching and listening for the name of the winners just like everyone else watching the ceremony in the Staples Center or at home. 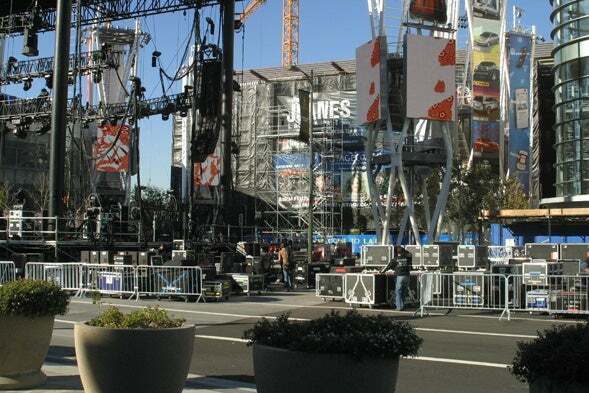 Crews set up for the Grammy Awards outside the Staples Center in Los Angeles. Once the presenter finishes reading off the list of nominees, rips open the envelope, and announces the winner, Johnson hits one of the buttons in front of him that’s cued up to play the winner’s song. The music kicks in so quickly, it’s often playing before the winning artists are out of their chair and in the aisle on their way up to the stage to collect the statuette. Johnston’s other tasks include playing the music that ushers the winners off stage once they finish their speeches (or sometimes, during the speeches if the list of thank-yous goes on too long) and cueing all the onstage audio during the ceremony. So another award-show mystery solved.